A location of breathtaking natural beauty! Located in the heart of the sunny Algarve, Vale do Lobo enjoys a privileged position along the golden coastline of Portugal's popular holiday region - an unspoilt area rich in history and culture. The resort is located just 20 minutes' drive from Faro International Airport, which is accessible from most major European cities in less than three hours. 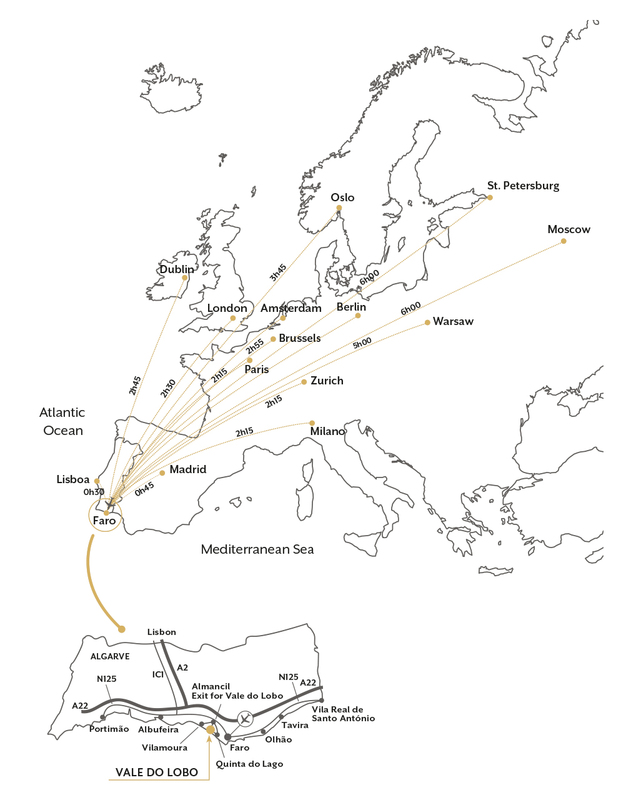 Lisbon, the Portuguese capital city, and Spanish city of Seville are around two and a half hours' drive away. Take the A2 motorway signposted Algarve, which will in turn take you to the main A22 motorway. Take the first left hand exit for Faro and drive on for around 25km. Take the exit for Faro airport and continue for around 5km. Take the turning for the town of Almancil when it appears on your right at which point you will be on the main EN 125 road. Continue following signs for Almancil. Follow the road straight through the town and over a roundabout. * Drive up the hill and turn left at the next roundabout which has many direction signs on it, including one for Vale do Lobo. Follow the road for 2 minutes, past a petrol station on your left. Immediately after the petrol station turn left at the roundabout (with large advertising hoardings beside it), following the sign for Vale do Lobo and continue along the same road for 6 minutes (6 kilometres). 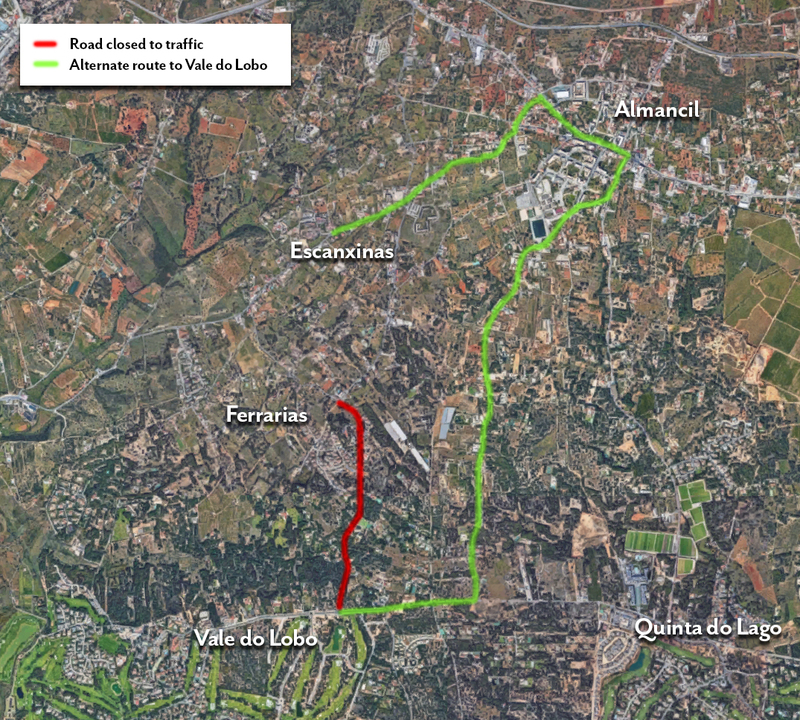 You will reach a roundabout, turn right here and simply follow the road directly to the main entrance of Vale do Lobo. On leaving the airport, drive for a couple of kilometres before taking the right hand turning marked "Portimão". You will then be driving on the main EN125 road. After about 8 minutes, you will see a right hand turning to the town of Almancil. Take this turning and keep following signs for Almancil, which will mean making another right turn about 4 minutes later, then continuing straight ahead. Follow the road straight through the town and over a roundabout. * Drive up the hill and turn left at the next roundabout which has many direction signs on it, including one for Vale do Lobo. Follow the road for 2 minutes, past a petrol station on your left. Please be informed that the EM 527road, between Hotel / Restaurant "A Floresta" and Vale do Lobo Roundabout is temporarily closed to all traffic.